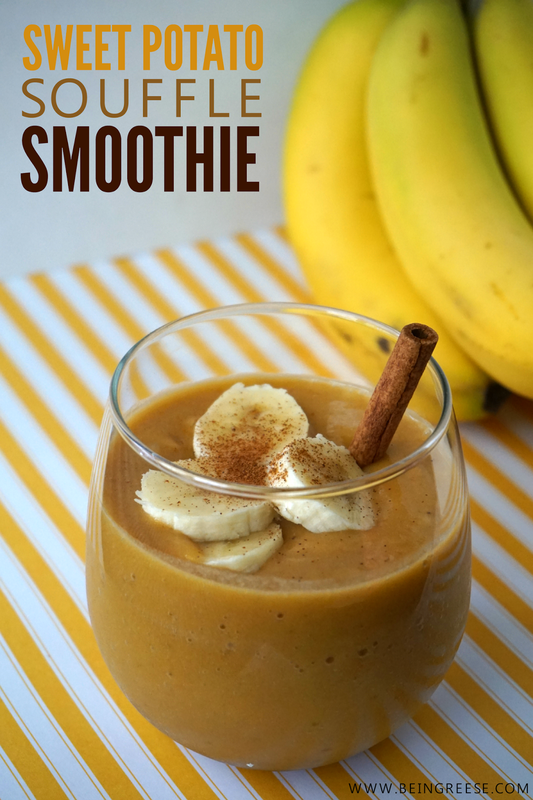 Today I'm sharing another one of my favorite smoothies. If you recall, juicing is also a big part of my life. Last year I discovered that you can juice sweet potatoes. Now it's actually one of my favorite juices. It's hearty, rich and VERY filling. Last week I decided that maybe the same rules applied to making smoothies. If I could juice it, then surly I could blend it. After a few fails on my part, it's safe to say I've finally perfected this particular smoothie. Today, I'm going to be sharing one of my newest smoothies with you-- Sweet Potato Souffle, and it's just as delicious as it sounds. 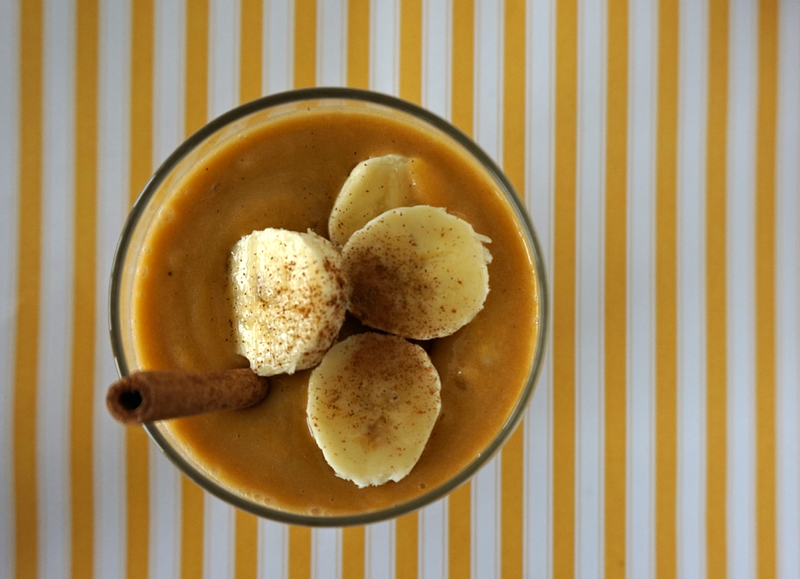 Since this recipe requires a sweet potato, it's best that you begin to boil the sweet potato at least 45 minutes before fixing this smoothie. I tried microwaving it, but in all honestly, it tastes much better if you boil the sweet potato. 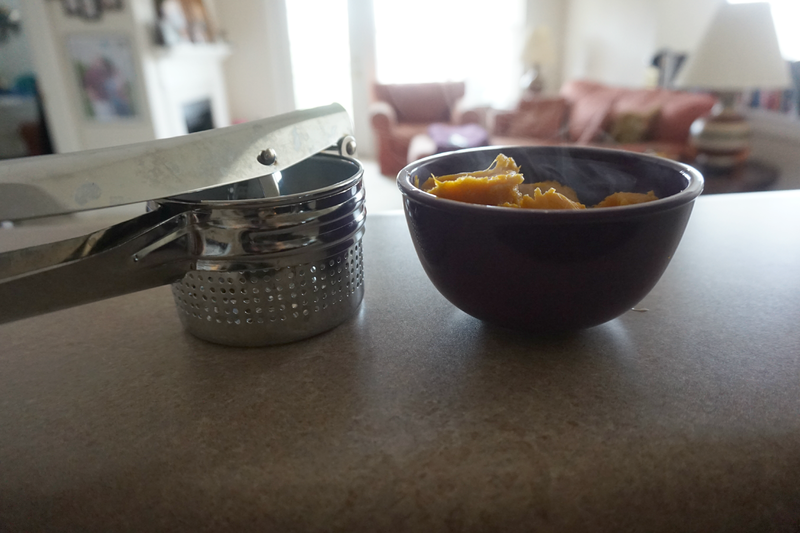 Once your sweet potato is done cooking, use a food mill or blender to remove the strings. Trust me, you do not want to skip this step! Next toss your sweet potato puree in the freezer and let it sit for about 10-15 minutes, or until it cools down. Then add your sweet potato, bananas, milk and extract to the blender. Blend well. Add ice if needed. Top with your garnishes, sit back and enjoy. This smoothie is one of my favorites because it's so smooth. It takes a few seconds for the blender to mix up your ingredients and you don't have to worry about unsightly and annoying pieces of fruits or veggies not blending all the way. Like it? Feel free to tweet, pin or share on Facebook! If you haven't already, be sure to enter into the giveaway to win that $50 Earth Fare gift card. Someone has got to win it, it might as well be you! Not sure why I've never thought to put sweet potato in a smoothie. Totally going to try it now! I make smoothies often, but have never tried to make them with sweet potato. Will have to try that for the future. Thanks for sharing! This looks really great! I am going to have to test this out! I have never put a sweet potato in a smoothie before! I would never have thought to put a sweet potato in a smoothie! Oh yum!